I created this recipe for our local newspaper before I discovered that a few of the products featured were to be discontinued by the store that advertises on the monthly food page. Normally that would send my tail into a spin, but I had played around with a Chocolate & Peanut Butter version using a really delicious peanut butter we get here in NZ. If you haven’t tried Pic’s Really Good Peanut Butter (no, they didn’t pay me to say this nor did they give me free product, I choose to buy their peanut butter because it contains one ingredient: peanuts; it tastes really good; it is made in New Zealand with peanuts sourced from Australia) then you are missing out. It is available at most major Supermarkets plus specialist food stores in New Zealand or you can order it on-line. It is also available in the UK, Australia, and the US. I also use their peanut oil and am hanging out for the Smooth Peanut Butter to appear on our shelves here in Gisborne. But I digress (Peanut Butter gets me quite enthusiastically off track) – back to the Mini mocha mud mouthfuls. I used to be a coffeeaholic and I am still a chocaholic. Now that I have reduced my coffee intake to one cup a day, I am trying to sneakily add more by including it in our baking. The actual truth is The Anster bought some chocolate coated coffee beans for me and I was scheming up a way of using them as I don’t so much enjoy just munching on them (sorry, Mr Anster). I love cupcakes but, as mentioned previously, find they are often all about the frosting or icing while the cake is neglected and is often dry, tasteless and disappointing. These cupcakes aren’t so much cup cakes, but cup-sized mud cakes. But then what are cup-cakes if not cup-sized cakes? I have reduced the butter and added in apple purée (as I do). I have also included yoghurt (as I do again). The cakes are so moist and delicious they can be eaten without any icing or frosting. These mini cupcakes are super easy to make – no beating the butter & sugar until creamy. I don’t dislike creaming butter & sugar but find I will opt for a recipe that doesn’t include that method. We have two favourite chocolate chip biscuit (cookie) recipes – one creaming, the other melt & mix. Both give similar results in biscuits. It’s the melt & mix one for me every time. So if you are after a delicious fudgy chocolatey mouthful then make these wee guys. The coffee isn’t very strong in the cake mixture – increase it if you like or use coffee extract instead of vanilla extract. However with the coffee extract in the frosting (icing) & chocolate coated coffee bean resting on the top, there is definitely a coffee hit to these little cakes. Prepare a muffin tin with cupcake papers (or use free-standing cupcake papers). Place butter, water, instant coffee & dark chocolate in a medium-large saucepan. Heat gently, stirring now and then, until the chocolate is melted. Remove from the heat and sift in the cocoa powder. Add the sugar then whisk the mixture. Place the yoghurt into a clean medium-sized (about 2 litres) glass jug. Stir in the baking soda and set aside (the mixture will bubble & fizz but that’s all good). Add the egg & vanilla extract to the chocolate mixture and whisk until the egg is all incorporated. Add the apple purée along with the bubbly yoghurt mixture and whisk again. Sift in the flour & baking powder and whisk until the mixture is smooth. Pour cake batter into prepared cupcake liners. Allow the cupcakes to cool on a cake rack. Once completely cold, ice & top with a chocolate coated coffee bean. The butter, cream cheese & yoghurt must all be at room temperature before making this frosting (icing). Place butter, cream cheese & yoghurt in a mixer bowl. Beat until smooth and fluffy. Beat in the coffee extract (I use the full 2 tsp as I prefer the stronger coffee flavour, 1 tsp is so mild even The Anster likes it (and he hates coffee)). Add 2 cups of icing sugar (sifted) and beat. You may need more, depending on how thick your yoghurt is. 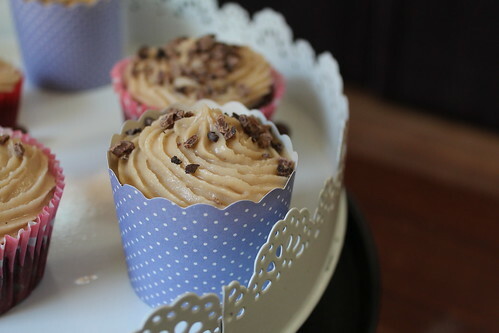 Add sufficient icing sugar to make a thick, pipeable icing that won’t slide off the cupcake. I use the full 3 cups. Once the frosting is thick and fluffy, scoop into an icing bag. There are really good instructions here for how to use an icing bag. I picked up the awesome trick on twisted the bag by the nozzle and tucking it in – that is the end of icing (we tend to call frosting “icing” here in NZ so I have used both terms interchangeably) dribbling over the floor, my slippers, the dog’s back and into the pots in the semi-open drawers. Squeeze a fairly generous amount of icing/frosting onto the cake (there is enough icing/frosting for a generous amount but not enough to have as much icing/frosting as there is cake. If you aren’t into piping, just smear the cake with icing/frosting. As you do. Once the cakes are all dressed, top them off with a dark chocolate coated coffee bean. You can also crush the coffee beans (in a mortar & pestle, by all means try the food processor but mine didn’t like coffee beans) and sprinkle the chocolate-coffee dust on top. Store the cupcakes/mud-cakes/what ever you want to call them in an airtight container. Be prepared for them to disappear in a whisker. 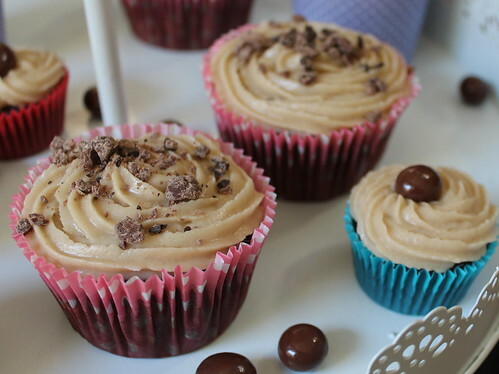 – Stay tuned for the Chocolate & Peanut Butter Mud-cake cup-cake topped with Chocolate & Honey Frosting & a golden caramel honey-roasted peanut version. It will feature on this blog before too long. It is also popular – you can’t beat Chocolate & Peanut Butter… except maybe with Chocolate & Coffee. – if the idea of yoghurt in your frosting/icing doesn’t appeal (it does add a lovely tang) then simply replace the 60 g unsweetened natural yoghurt with 60 g cream cheese (so you will have 120 g cream cheese in total). I find the yoghurt makes the icing/frosting less sweet. – I am not paid or given free product by Moccona coffee either, it is my preferred coffee. I have used a dark roast coffee with a strength of ‘8’ in these cupcakes. 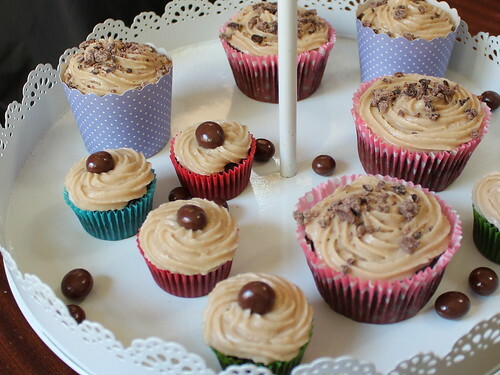 This entry was posted in Baking, Cupcakes and tagged cake, cupcakes, Mini mudcakes, Mocha cupcakes by Jo Dohrman. Bookmark the permalink.